Kahr Arms recently started shipping the Kahr CM9, the latest addition to their value based line of pistols. The Kahr CM9 is the same size as the Kahr PM9, which has been in production for years and has a dedicated following. The differences between the two pistols are largely cosmetic. As you can see, there aren’t a lot of differences between the two pistols. The CM9 saves cost by using a barrel with conventional rifling, a pinned front sight and a metal-injection-molded (MIM) slide stop level. Additionally, the CM9 only ships with one six round magazine, so you’ll want to order a couple more magazines. The Kahr CM9 is primarily a concealed carry pistol, and fills this role very well. The pistol is small enough to pocket carry while still giving you 7 rounds of 9mm. I have had this pistol for about a month now, and have carried it almost everyday. The CM9 is truly a “all day carry” pistol. The way I find myself carrying this pistol most days is in my front pocket using a Remora Series 3B holsterÂ or a Desantis N38 Nemesis pocket holster. While this pistol isn’t going to be as thin or light as a pocket 380 like the Ruger LCP or Smith & Wesson Bodyguard 380, but is still plenty small to fit into your front pocket, provided you aren’t wearing skinny jeans. Since I’m guessing you aren’t wearing skinny jeans (you aren’t, are you? ), this should fit into your front pocket just fine. Another great option is to carry inside the waistband (IWB). Some people love IWB carry, some do not, but if IWB works for you, you’ll love carrying the Kahr CM9 IWB. The pistol is extremely thin at .9″, and is very comfortable to carry IWB all day long. 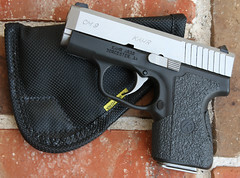 The Kahr CM9 is a very shootable small pistol. If you have shot many small pistols, you know that they are most often harder to shoot than larger pistols, and a lot times downright uncomfortable. This isn’t the case with the CM9. For a small pistol, it shoots very well. Having said that, if you shoot more than 100 rounds in a single range session, you might find, as I did, that the checkering on the front of the grip just below the trigger guard bites into your hand. Now this isn’t a problem if you’re only going to shoot 25-50 rounds at a time, but if you’re like me, that’s just a warm-up. I fixed this “problem” by ordering some excellent Talon Grips that were custom fit for the CM9. One of the major advantages the CM9 has over many of its competitors in my opinion is the trigger. The CM9 simply has a great double action trigger. The pull is fairly long, but is very smooth with a clean break, and is easy to stage for accuracy. Reliability has been 100 percent with my CM9 since day 1. Kahr has a specific way it recommends that you break-in your pistol, as these guns are machined to extremely tight tolerances. One of the recommendations is a minimum of 200 rounds before the pistol will function reliably. If you visit many gun forums, you’ll find a lot of debate on this issue, as to whether or not a gun should have a break-in period. You can decide for yourself. Personally, I’m going to shoot more than 200 rounds through any gun before I start carrying it, so the break-in period doesn’t bother me. Accuracy with my CM9 has been great for its intended use. This isn’t a long range pistol by any stretch, but as previously mentioned, it has an excellent trigger. Because of this excellent trigger, the CM9 is fairly accurate. I didn’t have any trouble shooting 2-3″ groups at 7-10′. The Kahr CM9 is a welcome addition to the concealed carry market. If you are looking for a small pistol that you can comfortably carry all day long even in warm climates, the Kahr CM9 needs to be on your list. Great review…wanted one before, but now I REALLY want one! Very well done review, Brandon. I’m going to be aiming to have one of these in my front pocket for summer CCW. I think it’ll be a nice compliment to my CW9 and ridiculously easy to conceal. Thanks man. Works great in the front pocket of my cargo shorts, I think you’ll like it.